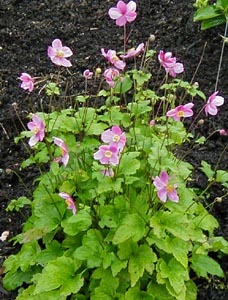 Joy Creek Photo Archive (c) all rights reserved Anemone x hybrida 'Bowle's Pink' is an extraordinarily robust plant that produces masses of single flowers that alternate pink and rose-colored petals. Try this in a dry shade area. The open saucer-like flowers bloom over a long period. Late summer to fall. 2.5 ft. x indefinite.